Showing results for tags 'elegant'. 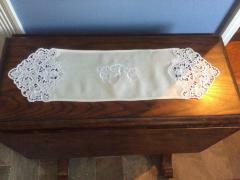 This is original and elegant interior napkin which is made in classic technique. It is ling piece of thin fabric with both ends decorated with Lace free embroidery design. Together they create completed composition full of beauty. 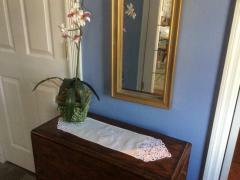 Furthermore they are added by embroidered monogram of this pretty napkin’s owner. Author of this embroidery is Claire Crawley Taylor (Alabama USA). This is beautiful embroidered picture made by Mellonie Adams which shows slim ballerina. She is making graceful bow after the performance. She is dressed in classical ballet tutu and pointe shoes. 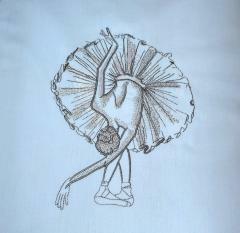 If you like this work piece you may take Graceful ballet dance sketch embroidery design to repeat it. This nice embroidered picture made in one color can be highlight of your home interior. On this photo you may see interesting collage which shows us all important details of this nice dress and clothing in general. 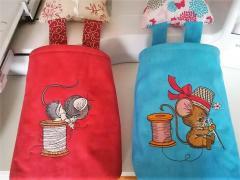 Author chose Sleeping moon and sun machine embroidery design for decoration of this work piece. Furthermore she repeats picture of sun on other parts of dress in larger size. It makes this clothing looks like night sky with stars on it. 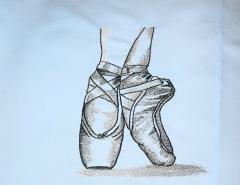 Pointe shoes machine embroidery design We make a gift for a young ballerina. 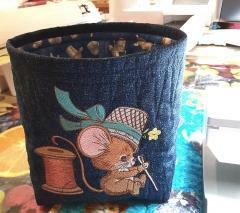 A small bag for ballet shoes. Simple and elegant. 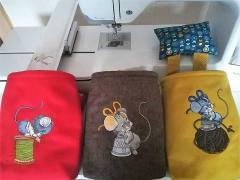 The ballet embroidery design is not complex, but requires good materials. There are dense places.